Last night I was captivated for 10 minutes watching bullfinches eat dandelion seeds in the long grass, clinging onto cow parsley and dandelion stalks while they ate – rather wobbily if the latter! 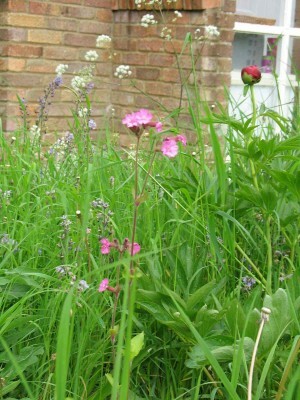 And here’s a photo of my red campion – still in bloom in July! Don’t be afraid in your posts to use images from flickr or other and websites where one can source info like that on the butterfly above. There is no problem to do so as long as you have permission and you cite the source. The very best of luck with you blog. Ps where are you posts for July?? Do try to have one a week or one a month – to keep peoples interest !! Hope you don’t mind all this feedback Jane?